Features: Foldable PU leather front cover, ABS backing cover with flocked lining, multiple viewing angles, magnetic closure with auto sleep and wake up function. 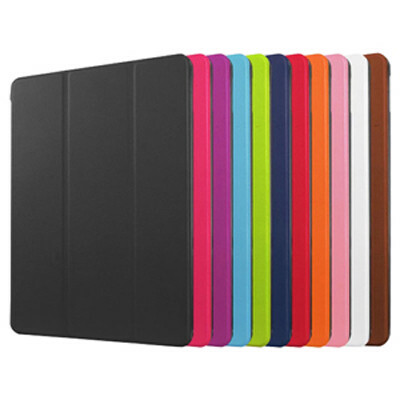 Please call us for any other tablet case requirements. Material: ABS, PU. Product Colour: Black, Blue (navy), Blue (powder), Brown, Green, Orange, Pink, Purple, Red, White. Product Size: 243 x 173 x 15 mm (external), 240 x 169.5 x 7.5 mm (internal). Print Area: 50 x 50 mm, 50 x 40 mm (front), 60 x 60 mm (rear - pad, deboss), 220 x 150 mm (rear - 4CP). Print Process: Pad Print, 4CP Direct Digital, Debossed. Delivery: 3-4 weeks (indent) from art approval. Standard Packaging: Poly Bag. Packing Details: 50 pcs per carton, 12 Kgs, 50x25x38 cms. Setups: Included.